On the outskirts of ancient Rome stands what remains of the villa owned by Livia Drusilla, wife to Caesar Augustus, Rome’s first and greatest Emperor. Though the villa was discovered and explored as far back as the 16th century, serious excavations did not begin until the 1860’s. In 1863 these excavations uncovered a remarkable work of art, the statue that would come to be known as Augustus of Prima Porta. Livia kept this marble statue of her husband, itself a copy of a bronze commissioned in 20 B.C. to celebrate Augustus’ great triumph over the Parthians. This statue is the first of the twenty-five objects through which we will explore the history of Christianity. Augustus’ ascension and the strength of his rule ushered in a time of peace and stability that historians have called the Pax Romana or “Roman Peace.” This was Rome’s golden age of cultural, scientific, and architectural advance. And this, the Pax Romana, provides the context for the dawn of Christian history. So strong was Augustus and so powerful what he set in place that peace would endure for over 200 years despite the weak rulers that would follow. But the Pax Romana was not a peace for all people. Though Rome had peace from civil war and serious internal challenges, she continued to assert her military might over the known world. Under Julius Caesar Rome had already been dominant in western Europe, but under Augustus her armies extended through eastern Europe, northern Africa, and the Middle East. Luke, the church’s earliest historian, records that “In those days a decree went out from Caesar Augustus that all the world should be registered” (Luke 2:1). When Jesus was born in Bethlehem of Galilee, he was born into a town and province subject to Rome and her Emperor. In Augustus of Prima Porta we see this Emperor at the very height of his power. Like today’s politicians, Augustus protected his image carefully and used it to convey something of his strength and attributes. Here he is young, athletic, powerful. His face is youthful and handsome, his right arm is raised in an address to his legions, his left leg is bent as he strides forward. This may not be an accurate portrayal of the man as he was, but certainly it is the man as he wished to be revered and remembered. Under his rule Rome did not only extend her empire but also consolidated and strengthened it. As the Roman armies conquered, officials followed behind to build the infrastructure necessary to support a mighty empire. Ports sprang up around the Mediterranean, the pirates that had once plied the seas were nearly eradicated, bandits and rebels were hunted down, and carefully-constructed roads connected one province to the next so that it could be said, “All roads lead to Rome.” These were the ports that would transport the earliest missionaries across peaceful seas and the roads that would allow the spread of Christianity to mimic the conquests of Rome, though where Rome conquered with sword and spear, Christians would conquer with a very different kind of weapon. Augustus even advocated religious tolerance, allowing other faiths to co-exist with Roman polytheism. His Pax Romana provided the infrastructure and stability that would allow the faith to spread far and fast. Yet in Augustus of Prima Porta we see the roots of the greatest challenge of the church’s infancy. At Augustus’ right side is Cupid astride a dolphin, reminding his subjects that he, like Julius Caesar before him, is descended from the Venus, the goddess of love. His bare feet both symbolize and declare his divinity, for where a mere man goes to war wearing boots, a god strides into battle barefoot. Augustus is not only a mighty Emperor, but a son of the gods. Augustus died when Jesus was still a boy, perhaps around the time Jesus visited the temple and chose to remain behind without his parents (see Luke 2:41ff). 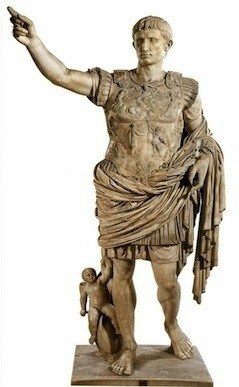 Augustus of Prima Porta was carved after Augustus’ death but was meant to reaffirm all his claims to divinity and, by extension, the claims of the emperors that would follow him. As Christians took advantage of the Pax Romana to spread their gospel message, a message that declared there was but one God and one way to God, they would eventually and inevitably come into conflict with these divine Emperors. There could be only one Son of God; there could be no room for another Savior when the Emperor himself was savior. Augustus was succeeded by Tiberius who was in turn succeeded by emperors whose reigns would be short and in many cases nearly forgotten. What remained consistent was the power of Rome and the power of its Emperor. The Pax Romana would survive for generations and with it the conditions that would unwittingly aid the spread of the gospel even while seeking to destroy those who proclaimed it. But where Augustus had been tolerant, his successors would determine that they must eradicate this upstart faith. Many of Jesus’ earliest followers would be imprisoned and punished and in some cases executed under the authority of these emperors. And so in this statue which is now nearly 2,000 years old, we see the context in which Christian history began. In his parting words to his most trusted followers Jesus commanded that they should go into all the world and take the gospel message with them (Matthew 28:16-20) but he also warned that the gospel’s advance would be met with fierce persecution (Matthew 10:16-33). In Augustus of Prima Porta we see the providence of God in bringing about conditions in which the gospel could spread quickly and widely and become firmly established in a short period of time. 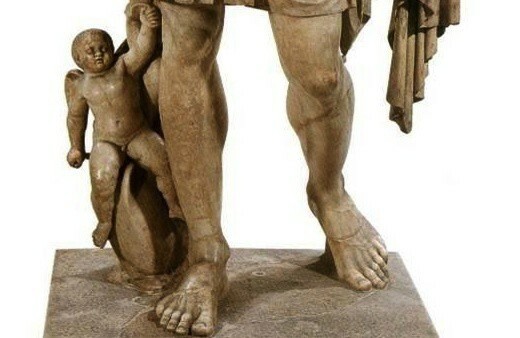 In the very same statue we see the adversity that would accompany and purify it, for as Tertullian would say in the next century and under the persecution of one of Augustus’ successors, the blood of martyrs is like a seed that causes the church to grow. From a priceless marble statue of a mighty Roman Emperor we will now travel 1,300 miles and turn our attention to a tiny scrap of parchment, the second of the twenty-five objects through which we will trace the history of Christianity. Augustus of Prima Porta is now on public display in The Braccio Nuovo at the Vatican Museum.